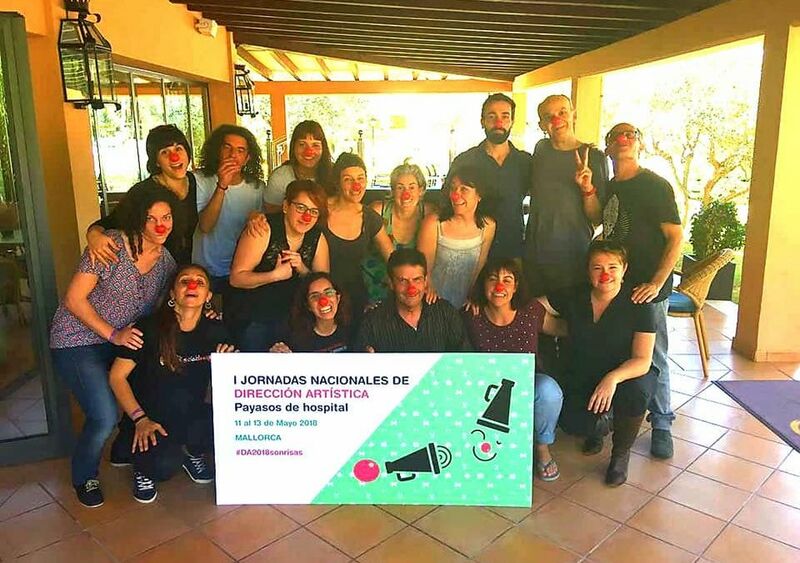 From the past 11th to 13th May, Sonrisa Médica organised the First National Workshop of Hospital Clowning Artistic Directors in Majorca. The main purpose of this Artistic Directors meeting was to delve into the Hospital Clowning methodology as a therapeutic tool in health care centres with the aim of offering a better quality in the accompaniment of pediatric and adult patients. This meeting was held in Mallorca thanks to the solidarity of the Majorcan hotel chain FERGUS Hotels, who offered to host all the participants in the facilities of their Club Vell Marí Hotel in Can Picafort. Participants in the meeting were representatives of the following associations: Algaraklown (San Sebastián), Cazasonrisas (Palencia), Clownrisas (Ciudad Real), Expressyourclown (Vitoria), PayasoSalud (Madrid), PayaSOSpital (Valencia), Saluticlowns (Tarragona), Saniclown (Madrid) ), Socialclown (Ibiza) Terapicclowns (Burgos), Tirita Clown (Palamós), Xaropclown (Girona) and Sonrisa Médica (Illes Balears).